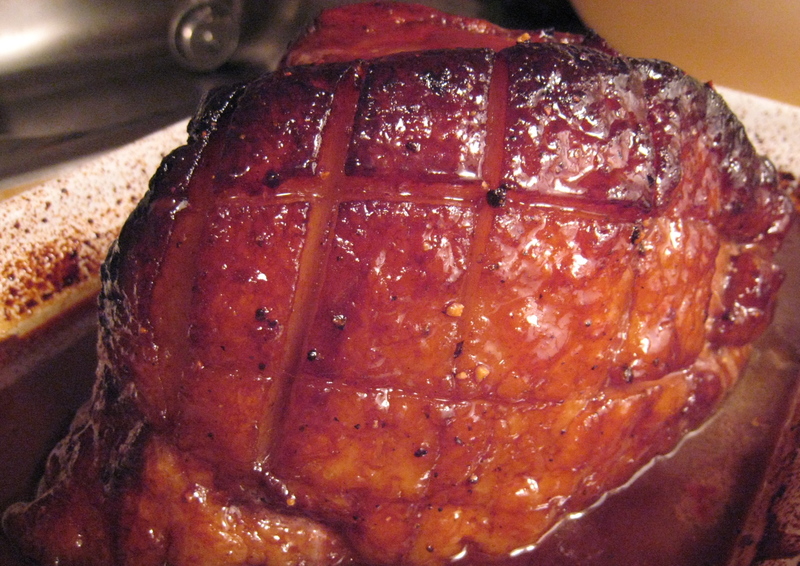 There was a special treat in the CSA basket last week: a beautiful ham. Growing up, hams in my household were always honey-baked affairs, spiral-cut and gifted by friends and relatives who came to the house bearing boxes of See’s Candies. I don’t think I ever remember my parents baking a ham themselves, so this was a new experience for me. What to do with a lovely ham? When Tina from High Point Farms suggested a glaze, something in clicked in my mind that I had filed away in my mental “To Cook” folder: pomegranate. I have been seeing crates of pomegranates lately in the market. ‘Tis the season! Though native to ancient Persia, the pomegranate figures prominently in the Greek myth of Persephone. Dear Persephone, minding her own business in a field, is abducted by her uncle Hades and spirited away to the underworld to be his bride. Overwrought with sorrow, her mother Demeter, Goddess of the Harvest, plunges the Earth into brutal winter. With nothing growing, Zeus sends Hermes to demand that Hades return her daughter to her. But not without caveats : Persephone can only return if nothing — no food nor drink — from the Underworld has passed her lips. Good Persephone had indeed been denying herself both, but when presented with a gorgeous pomegranate, she is unable to resist and swallows six ruby-red seeds. For this, she is allowed to be reunited with her mother for 6 months out of the year — 6 glorious months filled with sunshine and green, growing things — before returning to Hades, leaving her mother’s sadness to expand over the cold and frigid earth. Such a story! To be seduced by a pomegranate! Certainly something to think about as the ham bakes, filling the apartment with warm, cuddly smells of sweet spice and exotic fruit. Maybe, I wondered as I basted another candy-colored layer onto the ham, it was worth it after all? This recipe is from the terrific food blog, Food 52. It calls for pomegranate molasses, which I assume is easily available in most ethnic and specialty food markets. Actually, I wouldn’t know because I found it even easier to just make my own. You can too. The recipe is super easy and doesn’t require much attention, leaving you free to mind other things. The glaze is spectacular. So interesting, it is tart, tangy, sweet and smoky all at once. Don’t skip reducing whatever remains into a quick pan sauce and drizzling it with abandon on top of your pearly pink slices of ham. 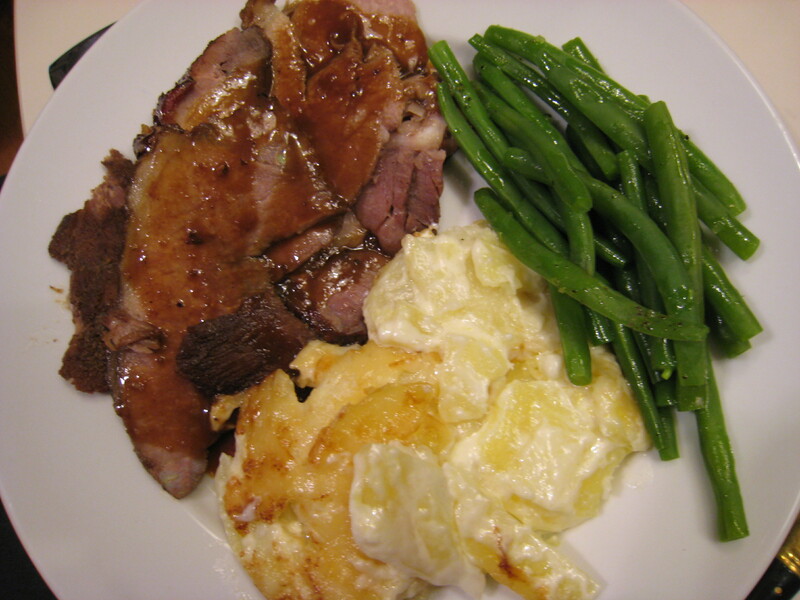 We served it with a golden potato gratin and some blanched green beans. 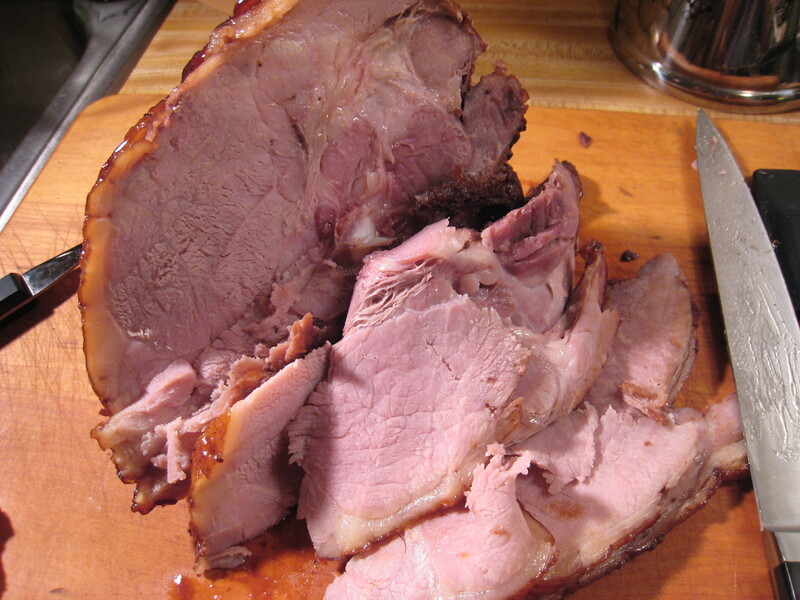 1 bone-in ham roast, about 3 lbs. 1. Let the ham come up to room temperature. Plan on about an hour before cooking. 2. Preheat the oven to 325 F.
3. To make the glaze, combine the pomegranate molasses, Dijon mustard, bourbon, pepper, allspice and salt in a bowl and whisk until well-blended. 4. Place the ham, fat side up, in a roasting pan. Score the fat in a cross-hatch pattern without incising the meat. Generously baste the ham with the glaze. 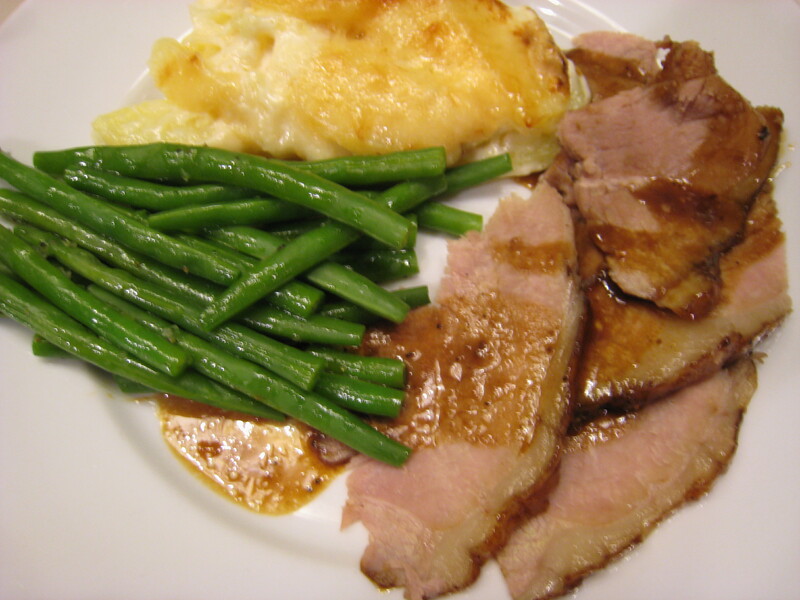 Bake it in the oven, basting occasionally, until the internal temperature of the ham is 120°. The ham should be a deep golden brown and crusty at this time. If not, increase the heat to 450° and continue to bake for a few minutes longer, keeping an eye on it so it doesn’t burn. Remove the ham from the oven and transfer it to a cutting board. Let it rest 20 minutes before carving. 5. Transfer the remaining basting sauce to a small saucepan along with the skimmed pan juices. Simmer everything briefly to thicken it and burn off the alcohol. Slice the ham and serve with the sauce drizzled on top. To make you own pomegranate molasses, combine 4 cups of 100% pomegranate juice (it can be from concentrate, just be sure to look at the label closely to make sure that the juice is not a blend), 1/2 a cup of sugar, and the juice of one lemon in a saucepan. Stir the mixture to dissolve the sugar and bring it to a boil. Lower the heat to medium-low and cook until everything has reduced to about a cup of liquid. You don’t really need to stir it at all. This should take about 60-70 minutes and you should end up with a thick syrup. Let the molasses rest for about 30 minutes. It should thicken a little more as it cools. Transfer the molasses to a covered container. It should keep in the fridge for about 6 months.